It’s Monday and I wish it was Tuesday. 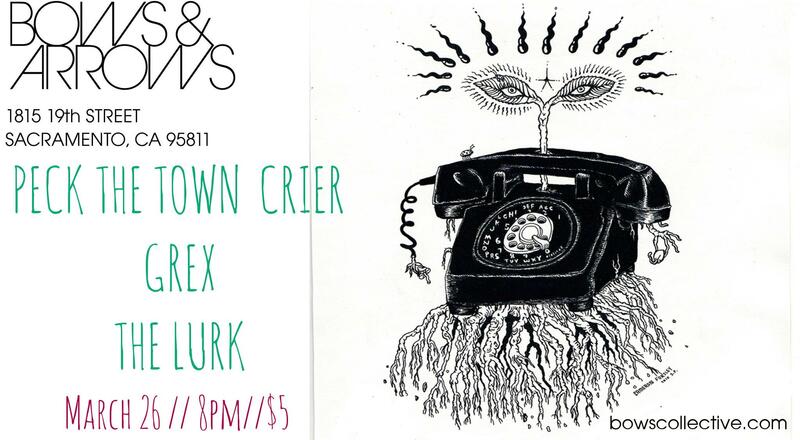 Here are two events that I am looking forward to and why: one is at Bows and Arrows featuring Peck The Town Crier, Grex, and The Lurk. This event starts at and has a cover charge of just $5.00. That ain’t bad. The thing that I enjoy about Bows and Arrows is I can shop for fashionable and affordable clothing and accessories while drinking a wicked awesome Ale and eating an amazing appetizer or sandwich. Have I said anything about the great bands they have playing tonight? Check them out… (http://peckthetowncrier.bandcamp.com/),(http://www.grexsounds.com/) & (http://thelurk.bandcamp.com/). And the other is at the Press Club. 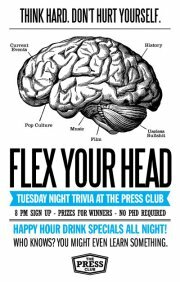 On Tuesday The Press Club features FLEX YOUR HEAD at 8pm/ starting at 9pm. Now they offer Happy Hour prices during the event. Bonus. O.k. Here is the deal. This is a team based trivia challenge that covers all sorts of topics. The other week I attended and it was all about Star Wars. It was NO JOKE. People were dressed up as cast members and answering the questions in some serious detail. All and All it was one of the better trivia’s I have attended on a Tuesday Night. Tags: accesseries, Ales, bows and arrows, City of Sacramento, clothing, downtown, downtown sacramento, FLEX YOUR HEAD, food, fun, Grex, happy hour, live music, live music sacramento, midtown sacramento, Peck The Town Crier, sac music, The Lurk, The Press Club, things to do, Trivia. Bookmark the permalink.